SLSR 25B Light Beam Safety Device provides the same advantages as the SLSR 46B. Just like the SLSR 46B, it is also a costs-optimized alternative for ranges up to 20 and 40 meters (with the SLSR 46B). It is particularly special because of its small dimensions for this performance class. The visible red light makes aligning so much easier. The SAT-5 alignment aid also provides an innovative alignment tool, especially for big ranges. The SAT-5 uses the sensor beam for aligning. Together with a Test Monitoring Unit such as TNT 35 or an MSI Safety Interface, for example, the SLSR 25B forms a type 2 active opto-electronic protective device. 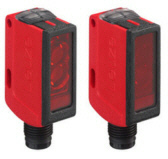 Purchase your Leuze SLSR 25B Single Light Beam Safety Devices today!